ElectroMagnetic Flow Meters, we are involved in supplying a broad range of ElectroMagnetic Flow Meters which is based on the principle of Faraday law of electromagnetic inductions. Made with higher precision these are used for measuring the voltage generated which is proportional to the flow velocity. With their efficiency, being ElectroMagnetic Flow Meters manufacturer and supplier in India. We offer these flow meters used in water & waste water, food & beverages and chemical & pharmaceutical industries. 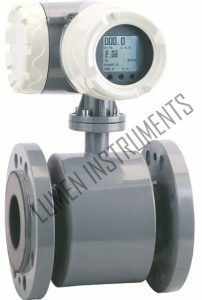 Lumen Electromagnetic Flow Meters are micro-controller based full bore type electromagnetic flow transmitters specially used for various industrial applications. The use of ‘Pulsed DC’ technology offers highest ability & better measuring accuracy in the form of electrical signal 4-20 mA DC linearly proportional to volumetric flow, The instrument is based on Faraday’s law of electromagnetic induction. Measurement is independent of, density, viscosity, temperature and pressure. High accuracy is guaranteed according to the linear measurement principle. Short lnlet and outlet runs. Dn 15 to Dn 1000 covers a wide range of pipe size. A variety of liners and electrodes are available to fulfil different flow characteristics and applications. High degree of reliability and measuring stability. Analog output signal 4~20 m A. Transmission output for digital communication. Medium temp range : -10~150 degree C.
Environment temp : 0~55 degree C.
Electrical power voltage – 220VAC 50Hz, 24 VDC.